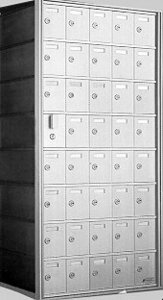 The Auth-Florence 1600 and 1700 Series Horizontal Mailboxes are constructed of the same heavy-gauge anodized aluminum as the 1400 and 1500 Series. They meet all USPS specifications except for those related to compartment size. Designed for use in dormitories, office buildings and other settings not serviced by the USPS, they are particularly suited for retrofit installations.